I expected to eat a lot more cheese; instead I ate a lot more carbs. My boyfriend re-named Vegetarian January “Carb-Loading January”, while moaning that this wasn’t helping him slim down his waist and beef up his biceps for our wedding. Meanwhile, I’d anticipated that I would swap out my charcuterie addiction for my cheese addiction and end up with dairy overload. Bizarrely, this wasn’t the case. It hit home the first Friday night of the month, when I ordered a veggie burger from my local café: a bread bun came topped with a starchy chickpea patty, served with fries. It was triple carbs from then on. I was hungry. All. The. Time. Despite the carb-loading, even if I ate a massive bowl of pasta at lunchtime, somehow by 3 pm I’d be starving again. I went from two meals a day to four. Nothing could sate the hunger-beast. Except meat – which apparently keeps you full for literally twice as long as anything else. Who knew? I neither gained nor lost weight. This was a weird one, because it didn’t happen immediately. I’d been vegetarian for about a week before I started waking up with headaches. They’d go away with coffee, sometimes returning in the early afternoon, when I’d take an ibuprofen if I really needed to concentrate. Five or six days later, they mysteriously cleared up again. Of course, there’s no way to tell if the headaches were actually related to the vegetarianism or something else going on in my body, but as I’m not generally prone to random headaches, it seemed likely there was a correlation. I drank more white wine than red (but slightly less wine overall). I like wine. A lot. And in winter, I’m generally more of a red wine drinker. However, most vegetarian dishes seem to lend themselves better to white wine. And, since the dishes I made often veered in an Asian direction (curries, stir fries, etc. ), I actually found myself drinking less wine overall because it didn’t pair well. Unexpected health benefit, I suppose?! My bin (trash can) stopped smelling bad. I did less washing up. Imagine you’ve been making a chicken curry, and at the end you come to chop up some coriander leaves to sprinkle on the top. At that point, you’ve got to wash your chopping board and knife, which are covered in raw chicken, before you can chop up the herbs that aren’t going to be cooked. Now imagine you’re making a veggie curry. Who cares if you’ve chopped up potatoes and cauliflower and then coriander? No one’s going to get salmonella! 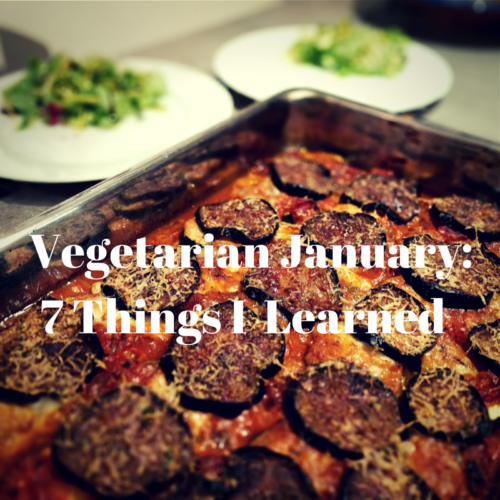 So, those were the unexpected things that Vegetarian January taught me. But what about the repertoire of recipes I expected to learn? 1. Vegetarian shepherd’s pie – I don’t generally approve of making meat-based dishes meat-free, but this one is arguably better than the original. However, I’d recommend leaving out the maple syrup (or only adding one teaspoon) because the other ingredients bring a lot of sweetness already. Recipe via the BBC. 2. Black pepper tofu – I’m not a fan of tofu, but this Ottolenghi recipe dresses it in so many spices that it becomes quite palatable. 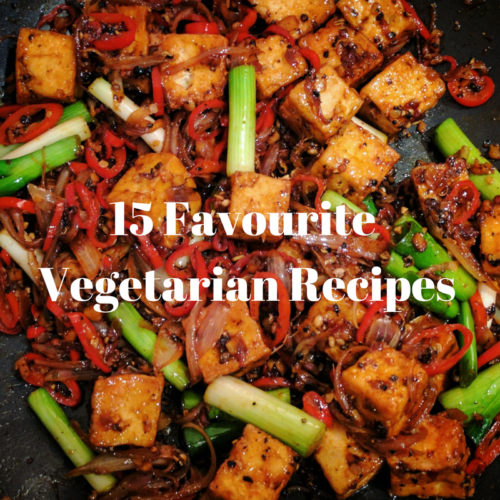 A good introduction to tofu for soy-newbies, so long as you like chilli! Recipe via Ottolenghi’s website. 3. Vegetable and mozzarella bake – a real comfort food dish, perfect for a cold Sunday evening in winter. Recipe via Living Magazine on Pinterest. 4. 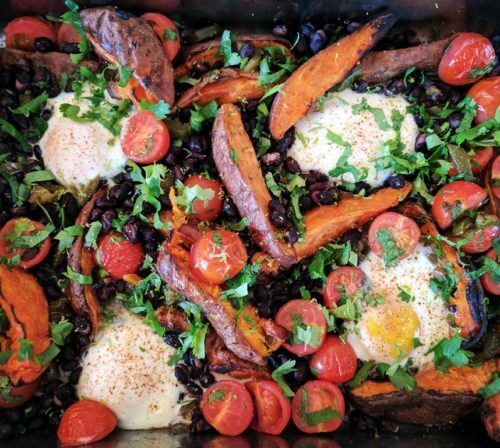 Baked eggs, sweet potato and black bean hash – an egg-cellent brunch dish that I spotted in a magazine and have made a few times since (not only during Vegetarian January!). Recipe on Pinterest. 5. Saffron tagliatelle with spiced butter – another Ottolenghi recipe, this time combining Moroccan spices with Italian pasta. And loads of butter – which makes anything taste amazing. Recipe via Ottolenghi’s website. 6. 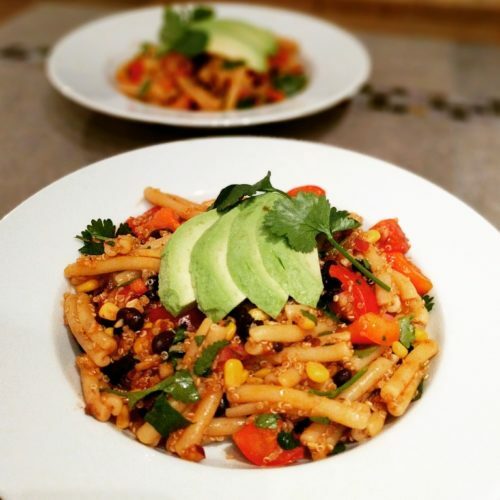 Chipotle quinoa and black bean pasta salad – just one of many tasty discoveries from food blogger Yogitrition. The smokiness of chipotle peppers make a great addition to pretty much anything if you’re craving meat, especially BBQ. Recipe via Yogitrition’s blog. 7. Soba noodles with aubergine and mango – I’ve actually been making this Ottolenghi recipe for years – I first discovered it when I invited a vegan to dinner. It’s become a staple in our house ever since. Recipe via Ottolenghi’s website. 8. 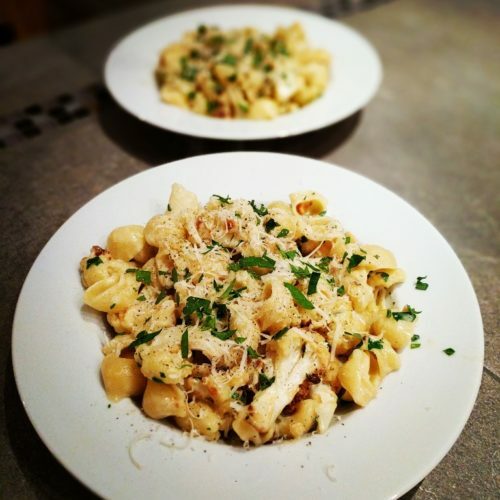 Cauliflower and hazelnut carbonara – I was debating whether or not to include this recipe, as of course it isn’t nearly as good as its guanciale-laden namesake. However, if you forget about its Roman history for long enough to cook and eat it (which isn’t long), you’ll enjoy it for what it is. Recipe via BBC Good Food. 9. Squash and ricotta pasta bake – another pasta dish, this time from Jamie. I’d suggest adding less stock and less pasta – this recipe says it’s for 4 people but you could easily feed 8! Recipe via Jamie Oliver’s website. 10. Multi-vegetable paella – again, this is one of those usually fish-oriented dishes that I didn’t think I’d like messing with. But Ottolenghi’s version with broad beans, fennel and plenty of saffron actually gives the regular variety of paella a run for its money. Recipe via Ottolenghi’s website. 11. Warm spiced cauliflower and chickpea salad – another favourite pre-Vegetarian January, this warm spicy salad by Nigella forms a simple week-night supper. Recipe via Nigella’s website. 12. 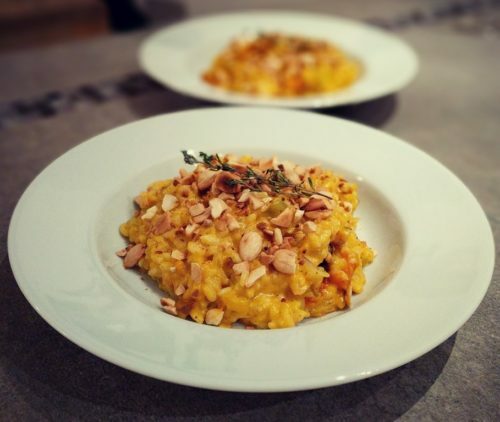 Pumpkin and goat’s cheese risotto – I didn’t use a recipe for this one. Just roast chunks of peeled pumpkin or squash in some spices and olive oil. Meanwhile, make a regular risotto (according to whatever recipe you use). Just before the end, mash half the roasted pumpkin and mix it through the risotto. Once the rice is completely cooked, add in the remaining pumpkin and crumbled goat’s cheese. Top with toasted almonds. Autumn on a plate. 13. 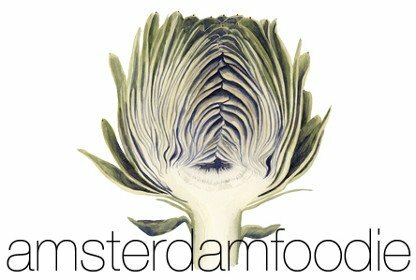 Caramelized endive with taleggio – a great starter for a dinner party by Ottolenghi. Recipe via The Guardian. 14. Vegetarian chilli – no need to follow this Jamie recipe to the letter. I threw in some extra veggies that I had around (leeks, carrots), as well as some chipotle for meaty-smokiness and cocoa powder for depth of flavour. Recipe (sort of) via Jamie Oliver’s website. 15. Anything with fake chicken! – yes, this is my controversial addition to the list… During my Vegetarian January Challenge, I tried out various meat substitutes: tofu, tempeh, soy-based “bacon” bits, and (also soy-based) fake chicken pieces. The only one I would buy again was the fake chicken – it goes great in anything you’d use diced chicken breast (curries, stir fries) or shredded chicken (fajitas, sandwiches) and you can barely tell the difference.